Greater Manchester bus route 192 runs between Hazel Grove and Piccadilly Gardens. It is operated by Stagecoach Manchester. The history of route 192 dates back to the days of horse-drawn trams, when a service from Torkington Road, approximately half a mile from the Rising Sun in Hazel Grove, commenced in 1889. It was operated by Stockport Carriage and Tramway Co, with vehicles purchased from the Manchester Carriage and Tramways Company. By 1905, the Council had purchased the line, and electrified it. By 1911 the line was completed to Hazel Grove, though still not a through service to Manchester. When the full route to Manchester commenced, it was initially numbered 35, with the Manchester terminus at Exchange. It was numbered 92 on 10 January 1949, when tramway service was withdrawn, and the Manchester terminus moved to Piccadilly Gardens. It was owned and operated jointly by Manchester and Stockport Corporations. On 1 November 1969, following the Transport Act 1968, both municipal operations, along with others, merged to form SELNEC. Within a short space of time, the route was renumbred 192. Over the next 17 years, the operator's title changed form from SELNEC, to Greater Manchester Transport, to Greater Manchester Buses. Following deregulation on 26 October 1986, the route was taken over by GM Buses, and other operators such as Finglands and Wall's Coaches introduced rival 192 services. On 31 December 1993, GM Buses was split in two, GM Buses North and GM South Buses, the latter of which became the main operator of route 192. In February 1996, GM South Buses was bought by Stagecoach and rebranded as Stagecoach Manchester. The service begins near the Rising Sun pub in Hazel Grove and operates via Stepping Hill, Heaviley, Stockport, Heaton Chapel, Levenshulme, Longsight and Ardwick to Piccadilly Gardens. In addition to the full route, which is run every 10 minutes or more during the day, there are numerous part-routes that are run: every 10 minutes between Stockport and Manchester all day, most of these were extended to Stockport College from 7 April 2013. It runs every 10 minutes between Levenshulme and Manchester in the afternoon and early evening; and journeys in the early morning and late night between Hazel Grove and Stockport. A further hospital bus serving Stepping Hill Hospital grounds also runs every 10 minutes all day. These part routes mean that the busiest part of the route is between Levenshulme and Manchester, with a bus coming on average every 2.5 minutes. A night service is provided on the 192 route on the full route on Fridays and Saturdays. Route 192 used to extend to serve Poynton, but this has since been taken over by other services. 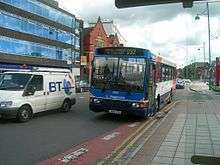 In March 2006, UK North decided to increase its level of operation to 12 buses per hour on route 192. The route was already well-serviced with frequencies of at least every 10 minutes. 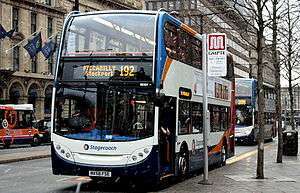 Stagecoach Manchester responded by increasing services, and introducing its no frills Magic Bus brand along the route to compete with the lower-priced UK North. This bus war resulted in the route becoming overly congested to the point of being dangerous, and forced buses to queue behind each other waiting for passengers. The situation ceased in December 2006 when UK North had its licence terminated due to concerns over the safety of its vehicles, and the standard of training given to its drivers. According to Stagecoach, the route is the busiest in Britain, with around 9 million passengers carried annually, and Transport for Greater Manchester has designated the A6 as a quality bus corridor. In October 2008, route 192 was the first in England to have solar-powered on-street ticket machines. The machines cost around £80,000 and were installed by Stagecoach and GMPTE for a 12-month trial, enabling tickets to be bought beforehand, saving time when boarding the bus. Route 192 bus is the subject of a musical album by singer Dave Hulston, who was born in Longsight. The album is named "Willow and the 192" and according to the Manchester Evening News was set to be released in the summer of 2007. ↑ Ian Yearsley and Philip Groves, The Manchester Tramways, TPC 1988. ↑ Postelthwaite, Harry (April 2008). Stockport Corporation. Venture Publications. ISBN 978-1-905304-17-2. ↑ "Eyewitness in Manchester: Exploring Levenshulme". Manchester Online. Archived from the original on September 28, 2008. Retrieved 8 May 2009. 1 2 "Key Dates in Greater Manchester's transport history". Greater Manchester Transport Museum. 1 2 3 "192 bus immortalised in song". Manchester Evening News. 31 March 2007. ↑ "Greater Manchester Transport And Beyond". The SELNEC Preservation Society. ↑ Tooher, Patrick (26 February 1996). "Pensioners lead protest at £41m Stagecoach takeover". The Independent. ↑ "Stagecoach Service Changes". Stagecoach Manchester. 22 March 2013. Retrieved 26 March 2013. ↑ "Minutes of a meeting of the Greater Manchester Passenger Transport Authority held on 13 April 2006" (PDF). GMITA. Retrieved 8 May 2009. ↑ "Improved Stagecoach service on the 192". Stagecoach Manchester. 28 March 2006. Retrieved 8 May 2009. ↑ "Council concerns over 'bus war'". BBC News Online. BBC. 3 April 2006. Retrieved 8 May 2009. ↑ "Bus companies banned from roads". BBC News Online. BBC. 22 December 2006. Retrieved 8 May 2009. 1 2 3 "New solar-powered on-street ticket machines for Manchester". Stagecoach Group. 10 October 2008. Archived from the original on 21 October 2008. Retrieved 8 May 2009. ↑ "Greater Manchester bus route investment reaches £80 million". GMPTE. 16 March 2007. Retrieved 8 May 2009.